The sleek, clutter-free Manhattan Comfort Cabrini Theater Entertainment Center transforms your living room in one fell swoop. Attach your TV to the built-in TV mount, and you're off to the races. A cable port is built into the middle panel, so you can conceal all cords and even the power outlets on your wall. Open shelves display your prized objects d'art, while three telescoping drawers conceal controllers, DVDs, spare batteries, and more. Three open device bays accommodate your gaming devices, DVD players, and more. Finally, overhead LED lighting illuminates the area and draws the eye. Overall Dimensions 60 in. TV Size: 71.25W x 16.73D x 67.24H in. 70 in. TV Size: 85.62W x 16.73D x 67.24H in. Drawer Dimensions: (each) 24.5W x 12.9D x 3.8H in. Manhattan Comfort, a developing furniture company based in New York City, began in 2008 with the goal of bringing modern and stylish furniture to living rooms nationwide. Gradually becoming a household name, they create quality furniture through a production process that ensures each piece created is flawless. They are committed to continually offering contemporary high-quality furniture at affordable prices. Choose an available size to suit your TV. 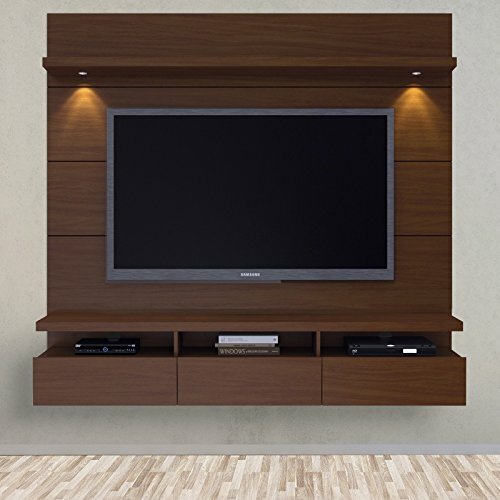 Crafted of engineered wood with veneers. Available in your choice of finish options. 3 cubbies and 3 telescoping drawers. Open shelving above and below your floating TV. Built-in overhead LED lighting. 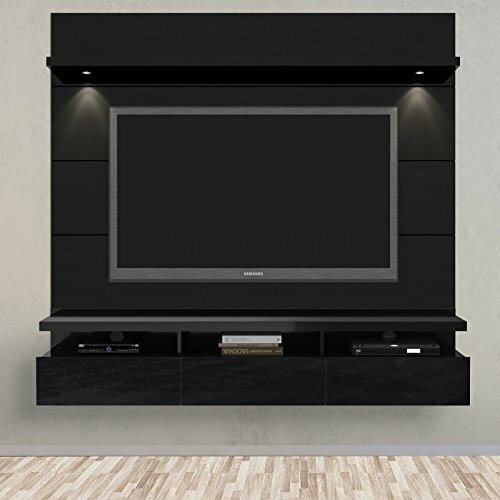 TV mount included; holds TVs up to 75 lbs.. Conceals all cables and outlets.